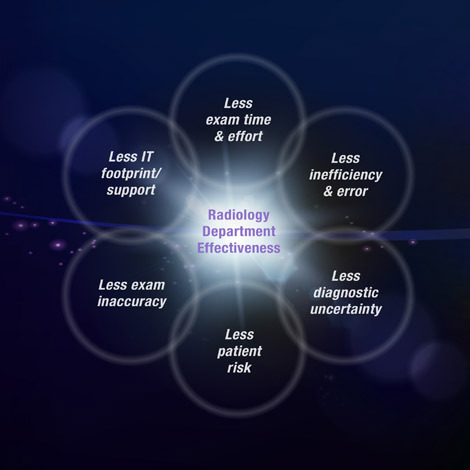 In today’s cost-driven healthcare environment, demands for greater returns on a technology investment impact diagnostic disciplines such as radiology. Any new system must deliver value, reliability and performance. The Imorgon Ultrasound Enhancement System™ helps radiology departments manage costs and improve the quality of patient care on several levels. The Imorgon System lessens the time and effort required for sonographers to conduct, manage and send exams. This in turn facilitates more streamlined, insightful radiology review. Workflow efficiency benefits, as does quality of care, since there are fewer patient holds, callbacks and re-scans. The Imorgon System reduces the time and effort associated with report dictation. Ultrasound system data and sonographer observations transfer automatically to dictation system templates, so there’s no need for redundant dictation of data. Patients ultimately benefit through elimination of misunderstandings and errors due to writing and reading of handwritten paper forms, manual dictation and verbal communication. The Imorgon System minimizes your IT footprint because it requires no additional hardware. It “shares the glass” with your existing PACS workstations and includes an integrated harmonization engine that provides vendor-neutral support for all major ultrasound and dictation systems. Support of DICOM SR data and electronic worksheets also helps eliminate potential equipment compatibility issues.